Properties in San Luis Obispo County average 4.7 out of 5 stars. Captain Java's Cottage in Morro Bay! Property 3: Captain Java's Cottage in Morro Bay! Property 6: Cozy Arroyo Grande Cottage w/Patio - Near it All! Property 8: Treetop Cottage - Unstoppable Views! Morro Bay Front Dream ⚓️ Overlooking Morro Bay & Bird Preserve - Pet Ok! Property 10: Morro Bay Front Dream ⚓️ Overlooking Morro Bay & Bird Preserve - Pet Ok! Studio, 1/2 Block to Harbor and Embarcadero, with small kitchen and Patio. Property 16: Studio, 1/2 Block to Harbor and Embarcadero, with small kitchen and Patio. Property 17: This Vintage Beach Cottage is located 1/2 block from the Harbor and Embarcadero. Just steps away from the Morro Bay Harbor and Embarcadero! Property 18: Just steps away from the Morro Bay Harbor and Embarcadero! Property 20: Cambria Lover's Cottage! Property 22: The Colony Cottage - Rural setting close to town. Property 23: 46 W, Winery close, Bocce! Perfect for 1 or 2 couples, Family & Dog Friendly! Stay a Half Block From Embarcadero- Walk to The Main Core of Morro Bay! Property 32: Stay a Half Block From Embarcadero- Walk to The Main Core of Morro Bay! Quiet, secluded, tucked away, walk to Bay, downtown and Embarcadero. Property 34: Quiet, secluded, tucked away, walk to Bay, downtown and Embarcadero. 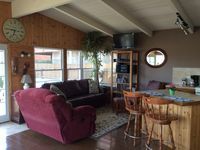 Cheerful Cayucos cottage within easy walking distance to town/beach! Property 37: Cheerful Cayucos cottage within easy walking distance to town/beach! Property 46: 🍷WINE, DINE, RELAX ON PINE! Walk downtown & State-Fair Great Location! Property 50: It Is Time To Play; Come And Stay At The Wine Travelers Hideaway! We loved it! It is clean, well equipped, cozy and comfortable. 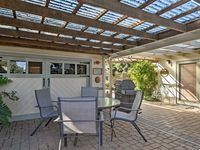 The patio and garden area are perfect and the owner who lives right there is very friendly and accommodating without being intrusive at all. We look forward to staying in this wonderful little cottage again! Everything worked well and Kelly was helpful as well.